english name "Chepang Slender Caesar"
1. Amanita chepangiana in association with Schima (Dipterocarpaceae), Nepal. 2. Amanita chepangiana in association with Schima (Dipterocarpaceae), Nepal. 3. Amanita chepangiana with members of the Fagaceae, Sichuan Prov., China. The cap of Amanita chepangiana is 130 - 190 mm wide, often pure white, sometimes with a slight grayish, brownish, or yellowish tint over the center. This species is one of the "Slender Caesar group" that has a cap that is not umbonate. The gills are free, close to subcrowded, white to very pale pinkish in mass, and up to 15 mm broad; the short gills are truncate, of varying length, adjacent to margin or stipe or neither. 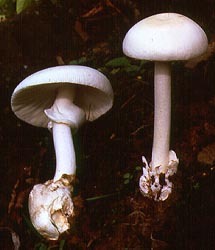 The stem is 150 - 180 mm long and about 20 mm wide (more or less); white; with a copious, skirt-like white annulus; and with a large, membranous, white, sack-like volva at the base. The external surface of the 50 - 60 × 35 - 50 mm, tubular, sack-like volva is white, sometimes with pale yellowish or pale tannish tints. 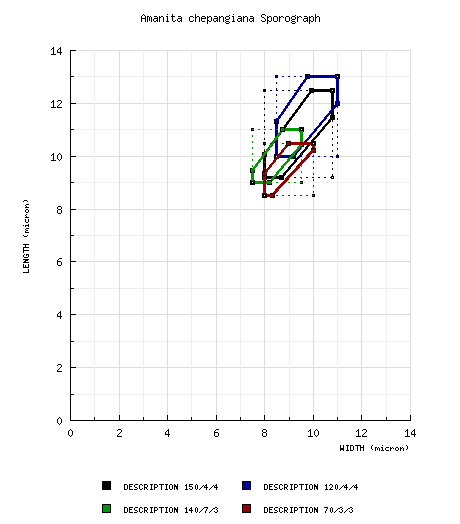 The spores measure (6.5-) 9.2 - 12.5 (-16.8) × (5.8-) 8.0 - 10.8 (-12.3) µm and are subglobose to broadly ellipsoid (occasionally globose or ellipsoid) and are inamyloid. Clamps are present at bases of basidia. discussion Like other members of the "Slender Caesar group" (e.g., A. jacksonii Pomerl. ), the present species has a substantial felted extension to inner limb of the volval sac. This limb may be carried up in its entirety by the edge of the annulus during stipe expansion, as in the drawing above (right). The "Slender Caesars" are technically called Amanita stirps Hemibapha. See Amanita hemibapha (Berk. & Broome) Sacc. for a discussion of this stirps. In the original description of this species, the spores were incorrectly described as amyloid. author Tulloss & Bhandary. 1992. Mycotaxon 43: 25, figs. 1-3.
etymology Chepang (a Nepali tribal group) + -ana, suffix indicating possession; hence, "of the Chepang"
This mushroom plays a role of the Chepang diet in the monsoon season. revisions Z. L. Yang. 1997. Biblioth. Mycol. 170: 56, figs. 41-43.
selected illustrations Tulloss. 2000a. Boll. Gruppo Micol. G. Bresadola 43(2): 17, fig. 8. When this mushroom was originally described, its authors erroneously placed it in Amanita section Amidella; this error was corrected by Yang (1997). The protolog text was based on lab work of R. E. Tulloss and field work, ethnomycological data, annotations, and photography of H. R. Bhandary. The description provided here combines data from the protolog with the more extensive data from the revision by Yang and from more recently collected material. NOTE: Spore data from papers by Z. L. Yang are presented following his use of the "Times New Roman" face for "Q" and "Q'"—respectively, "Q" and "Q." pileus 130 - 190 mm wide, milk white, at times slightly grayish to slightly yellowish (3A2 to 4A3) or tannish over disk, hemispherical (at first) to convex to expanded convex to planar or with disk somewhat depressed in age, somewhat shiny, becoming viscid when wet; context pure or milk white, thick, not discoloring or bruising, thinning evenly from disk to margin; margin decurved, becoming distinctly striate (0.1R - 0.15R) even in rather early stages of expansion, at times somewhat tuberculate striate[, probably appendiculate in early stages of expansion]; universal veil absent; pileipellis peeling from margin to center. lamellae free, crowded, thin and brittle, white with very slight pink tinge, drying 2.5Y 8/4 to 10YR 7/8 to about 10YR 8/3, up to 15 mm broad, with white edge minutely flocculent, some forking; lamellulae rather plentiful and of varying length, ?, ?subattenuate to ?attenuate. stipe 150± - 180 × 21± mm, narrowing slightly upward, flaring slightly at apex, covered with white flocculence or fibrillose to squamulose below annulus and pulverulent above it, turning pale yellowish or grayish when handled; context white becoming pale yellowish on bruising, stuffed with white cottony material to hollow, with central cylinder 6 - 17 mm wide; partial veil pendent, membranous, thin, white, apical to superior, upper surface striate, sometimes with thin limbus internus[?] reaching from lower edge of skirt-like partial veil to stipe; universal veil as large, white or whitish to pale yellowish or tannish (to 4A4) tubular volval sac, rather thick, leathery, less than 30% of sac below soil surface, distance from base of stipe to highest point of limb 50 - 60 mm, breadth 35 - 50 mm, with limb free for at least two-thirds of its length. odor/taste Odor none. Taste mild. tests NH4OH - negative in all parts. FeSO4 - negative on pileus. KOH - yellow­—3A3-4 on disk, 3A2 on pileus margin, 3A2 on gills, 3A2-3 on stipe apex, 3A3 on stipe flesh, 3A2 on stipe base. EDIBLE with caution (see discussion). pileipellis 120± µm thick; densely interwoven branching filamentous undifferentiated hyphae partially gelatinizing, 1.5 - 13.0 µm wide, dominantly subradially arranged; branching vascular hyphae present, 3.2 - 9.8 µm wide. pileus context loosely interwoven branching filamentous undifferentiated hyphae plentiful, 1.8 - 6.5 µm wide, with ventricose intercalary segments to 30 µm wide; inflated cells ovoid to broadly clavate to clavate, to 130 × 79 µm, thin-walled, plentiful; vascular hyphae scarce to absent. lamella trama obscurely bilateral, difficult to rehydrate; branching filamentous undifferentiated branching hyphae 1.0 - 20.0 µm wide; inflated cells thin-walled, difficult to rehydrate, to 44 × 37 µm; vascular hyphae present, 2.5 - 4.5 µm wide. subhymenium pseudoparenchymatous, with 1-2 cells below longest basidia. basidia 31 - 53 × 10.8 - 15.5 µm, mostly 4- and occasionally 3- or 2-sterigmate, thin-walled; clamps relatively common. universal veil On pileus surface: absent. On stipe base, exterior surface: gelatinized filamentous undifferentiated hyphae, in parallel groups or fascicles, orientation probably longitudinal, 1.4 - 9.8 µm wide; immediately below surface, hyphae losing parallel orientation and becoming tangled and interwoven; vascular hyphae common 4.5 - 9.1 µm wide, branching, locally in tangled knots. On stipe base, interior: dominated by branching filamentous undifferentiated hyphae 2.1 - 10.5 µm wide, interwoven among inflated cells, often forming fascicles; inflated cells clavate to 143 × 37 µm, subglobose or ovoid to 161 × 95 µm; vascular hyphae 2.1 - 11.2 µm, common; clamps present and rather frequent. On stipe base, inner surface: largely comprising gelatinized hyphae, with scattered loose inflated cells, not completely rehydrated, to 39 × 24.5 µm; vascular hyphae 1.4 - 21 µm wide, branching, common. stipe context longitudinally acrophysalidic; dominated by filamentous undifferentiated hyphae 4.0 - 14.5 µm wide; acrophysalides rather narrow, clavate to ovoid, to 162 × 43 µm; vascular hyphae present, 4.0 - 20.3 µm wide. partial veil composed entirely of subparallel radially oriented filamentous undifferentiated hyphae. composite from material revised by RET: [150/4/4] (6.5-) 9.2 - 12.5 (-16.8) × (5.8-) 8.0 - 10.8 (-12.3) µm, (L = 10.1 - 11.0 µm; L’ = 10.5 µm; W = 8.7 - 9.4 µm; W’ = 9.1 µm; Q = (1.02-) 1.06 - 1.26 (-1.39); Q = 1.14 - 1.17; Q’ = 1.16), colorless, hyaline, thin-walled, inamyloid, subglobose to broadly ellipsoid, occasionally globose or ellipsoid, frequently adaxially flattened; apiculus sublateral, cylindric; contents guttulate; white with very slight pink tint in deposit. from the revision of Yang (1997): [120/4/4] (8.5-) 10.0 - 13.0 (-16.0) × (7.5-) 8.5 - 11.0 (-11.5) μm, (Q = (1.04-) 1.09 - 1.33 (-1.52); Q = 1.19 ± 0.08), subglobose to broadly ellipsoid, rarely globose or ellipsoid, colorless, hyaline, mostly smooth, occasionally with very fine warts, thin-walled; apiculus 1.0 - 1.5 μm long. from Yang (2000): [140/7/3] 9.0 - 11.0 (-12.0) × 7.5 - 9.5 (-10.5) μm, Q = (1.05-) 1.10 - 1.26 (-1.33); Q = 1.18 ± 0.06), hyaline, colorless, smooth, thin-walled, inamyloid, subglobose to broadly ellipsoid, rarely ellipsoid. from the revision of Yang et al. (2001): [70/3/3] 8.5 - 10.5 (-12.0) × (7.0-) 8.0 - 10.0 (-11.0) μm, (Q = (1.0-) 1.02 - 1.17 (-1.19); Q = 1.10 ± 0.05), subglobose, sometimes globose or broadly ellipsoid, colorless, hyaline, thin-walled, inamyloid. ecology Solitary to subgregarious or occurring in troops. China: In mixed Pinus-Quercus forest) or on soil in forest. Nepal: In Shorea robusta Gaertn. forest. material examined from Yang (1997): CHINA: SICHUAN—Liangshan Yi Autonomous Prefecture - Xichang (county level) City, Luojishan, 1800 m elev., 22.vii.1992 P. W. Sun 1887 (HKAS 25772); Xichang (county level) City, Luojishan, 2000 m elev., 9.viii.1986 M. S. Yuan 1257 (HKAS 18380); Xichang (county level) City, unkn. loc., 20.vi.1971 S. X. Wei & Y. C. Zong 60 (HMAS 35972), 9.vii.1971 Y. C. Zong & S. X. Wei 160 (HMAS 35973). from Yang (2000): CHINA: JIANGSU—Nanjing (sub-provincial) City - former city of Nanjing, unkn. loc., 28.vi.1936 H. N. Shen 318 (formerly "IBN" s.n. ; BPI 749952, CUP-CH 2082, as "Amanita caesarea var. alba"), 14.vii.1937 S. C. Li 293 (formerly "IBN" s.n. 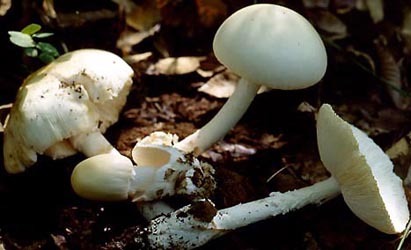 ; BPI 749950; CUP-CH 1963, as "Amanita caesarea var. alba"); former city of Nanjing, Linggusi woods, 14.vii.1937 S. C. Li 188 (formerly "IBN 749"; BPI 750108, as "Amanita caesarea var. alba"). from the revision of Yang et al. (2001): CHINA: HAINAN—Changjiang Li Autonomous Co. - Bawangling, 15.vi.1987 Q. Chen s.n. (HMIGD 15217, as "Amanita virosa" in Bi et al. (1997)), 21.vi.1987 Q. Chen s.n. (HMIGD 12114, as "Amanita muscaria var. alba" in Bi et al. (1997)). Ledong Li Autonomous Co. - Jianfengling, 15.v.1987 Q. Chen s.n. (HMIGD 14402, as Amanita caesarea var. alba" in Bi et al. (1997)). RET: NEPAL: BAGLUNG DISTRICT—Salleghari, Dhanlagiri Zone, 19.vii.2007 Sanjib Shrethsa 154(P) (UTC). CHITWAN DISTRICT-Jugedi - vii.1986 Hemanta Ram Bhandary s.n. (paratypes, NHMTU 02837 & RET 075-7), 12.vii.1990 H. R. Bhandary Ha (isotypes, NHMTU & RET 259-8), Hb (holotype, NHMTU; isotype, NY). discussion This species is assignable to Amanita stirps Hemibapha. When A. chepangiana is collected for food, all stages from the button to the mature are included. All parts except the volval sac are utilized. A common means of preparing A. chepangiana for the table is as follows: Break the fruiting bodies into small pieces with the fingers or cut it in small pieces with a knife. Rinse the pieces to remove all remnants of soil or debris. Add the pieces to a scant amount of very hot cooking oil and mix with a selection of crushed spices including cumin seed, coriander seed, turmeric powder, a few Zanthoxyllum fruits, garlic and red chili (Capsicum frutescens L.). Cook for 5 - 10 minutes; then add a little water and simmer for 10 minutes. Serve. Amanita chepangiana is sometimes offered for sale to hotel keepers who prepare meals for travelers along the highway in Jugedi. It is considered a highly favored edible by the Chepang people. Amanita chepangiana is said to be very common around Jugedi only between the second week of May and the last of June (late spring and early monsoon seasons). It is said to be as tasty and abundant as an undetermined mushroom close to Amanita hemibapha (Berk. & Broome) Sacc. which fruits at the same time. Together, they are so abundant in the Jugedi forest area that, in spite of being prized edibles and the many persons seeking them, many of them go uncollected. Some poor persons, who have no alternative but to take the readily available A. chepangiana as their staple food during its season, eat it three or four times a day without adverse effects. However a few children below 10 years of age are believed to be affected with a kind of intestinal disturbance called karkaley maasi (in Nepali), a disease with symptoms similar to those of Giardiesis with frequent discharge of slimy bowels. The Chepangs call A. chepangiana "vaam waaum moo" or "vaam waaum"; and they call the entity close to A. hemibapha "yaar waaum moo" or "yaar waaum." In the Chepang dialect, vaam means "white"; yaar means "yellow"; and moo means "mushroom." The Gurung name for both of these fungi is naagfum. A common name for A. chepangiana in Nepali is seto kukhura phooley chyaau (white egg mushroom). The hemibapha-like entity is called pahe:lo kukhura phooley chyaau (yellow egg mushroom) in Nepali. The ":" represents a nasal sound. 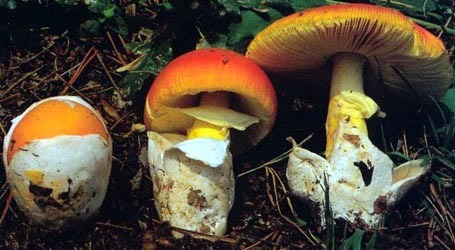 In the Jugedi area, there is reported to be another edible entity, probably belonging in Amanita, and which is said to be very rare and available during early monsoon to, perhaps, mid-monsoon. According to Bhandary’s informants, this mushroom is slightly tastier than the two discussed above, is white, and has a shorter stipe than A. chepangiana. The Chepang refer to this entity as miloo (smaller) vaam waaum moo. photo H. R. Bhandary - (1) Nepal. Zhu-liang Yang - (3) Sichuan Province, China. drawing Neal Macdonald - (2) from a photograph of H. R. Bhandary, Nepal. select a collection to review/add spore measurements..#701780. Hemanta Ram Bhandary, #s.n., NEPAL, CHITWAN DISTRICT, -Jugedi, unknown ..#701781. H. R. Bhandary Ha, #s.n., NEPAL, CHITWAN DISTRICT, -Jugedi, unknown loc..#701782. H. R. Bhandary Ha, #Hb, NEPAL, CHITWAN DISTRICT, -Jugedi, unknown locat..#783172. P. W. Sun, #1887, CHINA, SICHUAN, Liangshan Yi Autonomous Prefecture, X..#783173. M. S. Yuan, #1257, CHINA, SICHUAN, Liangshan Yi Autonomous Prefecture, ..#783174. S. X. Wei & Y. C. Zong, #60, CHINA, SICHUAN, Liangshan Yi Autonomous Pr..#783175. Y. C. Zong & S. X. Wei, #160, CHINA, SICHUAN, Liangshan Yi Autonomous P..#783176. H. N. Shen, #318, CHINA, JIANGSU, Nanjing (sub-provincial) City, former..#783177. S. C. Li, #293, CHINA, JIANGSU, Nanjing (sub-provincial) City, former c..#783178. S. C. Li, #188, CHINA, JIANGSU, Nanjing (sub-provincial) City, former c..#783179. Q. Chen, #s.n., CHINA, HAINAN, Changjiang Li Autonomous Co., Bawangling..#783180. Q. Chen, #s.n., CHINA, HAINAN, Changjiang Li Autonomous Co., Bawangling..#783181. Q. Chen, #s.n., CHINA, HAINAN, Ledong Li Autonomous Co., Jianfengling#783182. Sanjib Shrethsa, #154, NEPAL, BAGLUNG DISTRICT, Salleghari, Dhanlagiri ..#783183. Hemanta Ram Bhandary, #s.n., NEPAL, CHITWAN DISTRICT, -Jugedi, unknown ..#783184. H. R. Bhandary Ha, #s.n., NEPAL, CHITWAN DISTRICT, -Jugedi, unknown loc..#783185. H. R. Bhandary Ha, #Hb, NEPAL, CHITWAN DISTRICT, -Jugedi, unknown locat..